I must be hungry, I’ve been posting about food a lot lately! 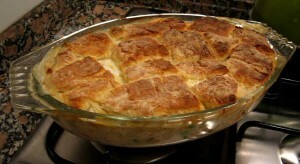 Last week, when Tom and I were looking for an easy meal to make out of a rotisserie chicken, we decided to attempt a chicken and dumplings type of dish using buttermilk biscuit dough. We didn’t have buttermilk, so we had to obtain some lemons to sour our own milk. We had a hard time finding edible frozen peas. We had to substitute massive amounts of baking powder for baking soda, which affects the flavor. We only have a tiny food processor, so I had to cut the butter into the dough in batches. 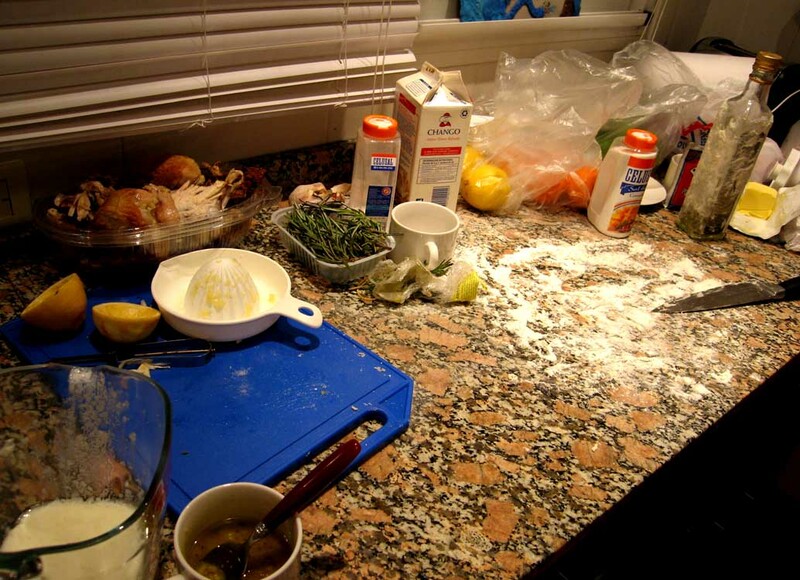 I made half of a batch in the food processor and combined it with the buttermilk only to find we were severely short on baking powder, so Tom and the girls had to dash out and buy more while the first half of the dough was soaking up the moist ingredients. After scouring the store’s three different sections that contained baking ingredients, the Offermann shopping team finally found the polvo de hornear and raced home. We didn’t have cake flour. We didn’t have a rolling pin, so I used the rectangular olive oil bottle to roll out the biscuit dough (pictured above). As mentioned previously, we had no measuring implements — we just eyeballed everything! We made a huge mess. Unfortunately, our “easy” meal proved to be anything but; however, we did end up with a lovely looking chicken and dumplings that actually tasted good to boot! This entry was posted on Sunday, May 24th, 2009 at 9:14 pm. You can follow any responses to this entry through the RSS 2.0 feed. You can leave a response, or trackback from your own site.